last update June 23rd - please scoll down in the article and read! 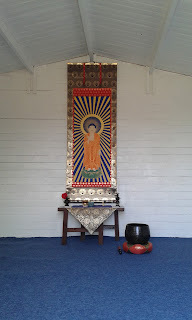 As some may already know, the naijin (inner area) is the altar area of a Jodo Shinshu temple in Japan where usually only priests are allowed to enter. This situation is copied by many Shinshu temples outside Japan, too. There, in the naijin, the Buddha statue, whose face is sometimes partially covered by a kind of rich material, is enshrined in a big decorated box. Also there are some minor altars of Shinran, Rennyo, the seven Patriarchs and Shotoku Taishi. Another important element is that the naijin is placed on a little raised platform, which means that priests actually stay higher than lay people. Because of all these, and also because the altars are in the back of the naijin, lay people who attend the service and Dharma talks from the gejin (outer area/sitting area) can hardly see the statue and the images on the minor altars. However, at Amidaji temple we’ll never follow these Japanese customs. Now the Hondo (main hall/Dharma Hall) is small, but even when it will be bigger, there will be no naijin or special area for priests. When priests conduct services or give a Dharma talk they will be at the same level with lay people. This is because, although the priest and teacher may be useful in leading people to shinjin (faith in Amida Buddha), actually the shinjin of the priest and that of the lay person, as well as salvation, comes only from Amida Buddha. Also, priests who chant hymns and conduct religious services will face the altar. Sometimes, in Jodo Shinshu temples in Japan or elsewhere, priests chant facing each other, but we’ll not do this at Amidaji. Of course, teaching will be done facing the audience. 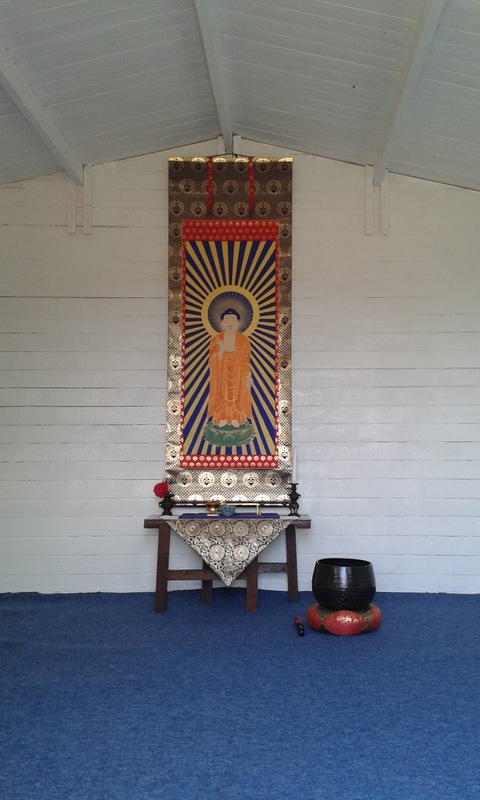 Next, the main object of worship, that is, Amida statue or image (the bigger, the better), will never be put in a box, but only on the table altar, so that it can be easily seen and venerated by all people in the audience. I think its of utmost importance that Amida statue can be seen and approached by devotees. People should be able to come close to it, put flowers and incense, touch it, etc. I do not understand why there is this custom that only priests enter the altar area, and lay people are not allowed. It really has no scriptural support, and is not faithful to the spirit of Shinran's teaching and Amida Buddha's indiscriminative Compassion. This was my answer: I did not say that the “purpose” of naijin is to place priests higher than laypeople. However, this is what it actually happens, even if they did not intend that. Because naijin is a special elevated place reserved for priests only it creates a separation which has no scriptural support. The fact that in a big gathering there is not enough space in the naijin and some priests stay in the geijin is NO argument against the fact that naijin is especially made for priests only, again with NO doctrinal support! Also the naijin does not help lay people see the image of Amida Buddha as they are very far from it in the gejin. I went to many Japanese temples and in fact, the naijin prevented me to see all the objects of worship when I stayed in the gejin! I and many other non-japanese felt frustration in Japanese style temples, because we cannot see Amida very clearly due to that highly decorated box and altar in the naijin, and that cloth on His face and because of the distance. Also, sometimes when the temple is still opened for visitors but there is no service, the box where Amida stands is closed. Also, the space dedicated to naijin is closed by a big decorated screen. I prefer temples where the statue or image can "breathe" , be accessible and open all the time for devotees to come closer, watch it, and venerate it. The Japanese style may work for Japanese, but it does not work for many others and if we want to make Jodo Shinshu universal and appealing to all we should be opened to change some Japanese customs if we consider them not useful (attention here, I don't speak about doctrinal change, but only some Japanese customs!). Devotional atmosphere is very important in a faith oriented school like ours and it cannot be created for all if we put Amida in a box and in a naijin so far from public eyes. If you want a japanese style temple in your town, then make one (I know you are a big fan of Japanese style), I respect that choice, but I at Amidaji I will not do that.